Gleim, the publisher of the red study guides, now offers aviation weather on its website. The Gleim weather page contains a map of the United States with links to all weather radar sites throughout the country, as well as those in Alaska, Hawaii, Guam, and the Caribbean. 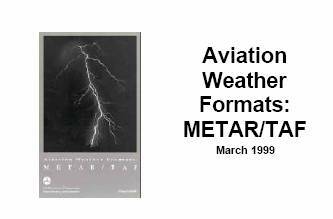 You can also easily access text weather information such as area forecasts, TAFs, METARs, and winds aloft for all U.S. reporting stations. Plus, extended forecasts are available for almost every city in the United States.